Life is a great teacher. The longer you've lived, the more you've learned and the more you can teach." 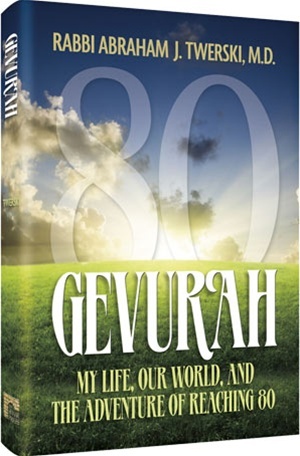 - From Gevurah: My life, Our World, and the Adventure of Reaching 80. As a bestselling author and world-renowned psychiatrist, Rabbi Abraham J. Twerski has seen much and accomplished much. Gevurah tell his story: the young American being brought up in Milwaukee in a home steeped in Chassidic tradition; the medical student at a time when a Shomer Shabbos doctor was a rarity; the author (of 61 books!) who honestly and wryly admits that writing is his addiction; the psychiatrist who changed the way we look at mental disorders. 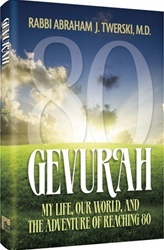 More than an autobiography, though, Gevurah offers Rabbi Dr. Twerski's wide-ranging perspective on our own concerns. Whether discussing the contemporary challenges of childrearing, the importance of prayer in our lives, or how to achieve authentic Torah values, Rabbi Dr. Twerski is articulate, often funny, and always very, very wise.